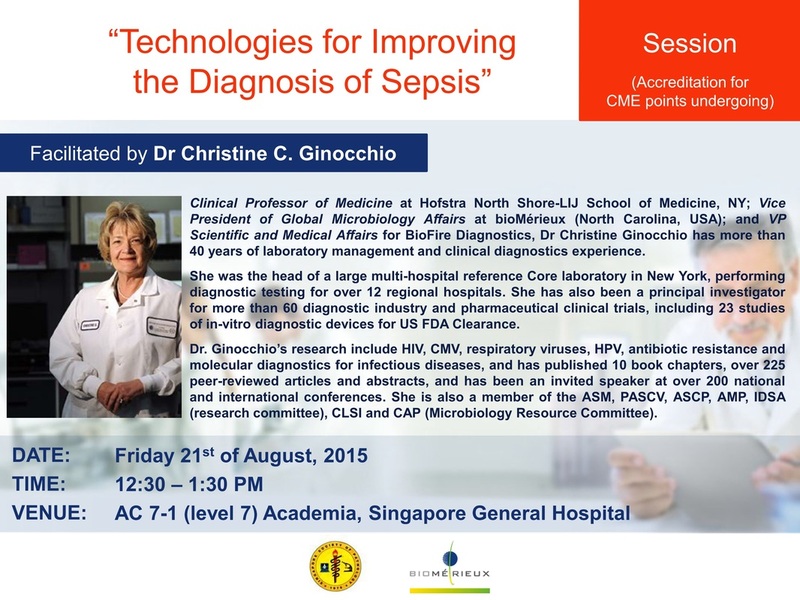 Organised by the Chapter of Pathologists, Academy of Medicine, Singapore; Singapore Society of Pathology and Department of Pathology, Singapore General Hospital. 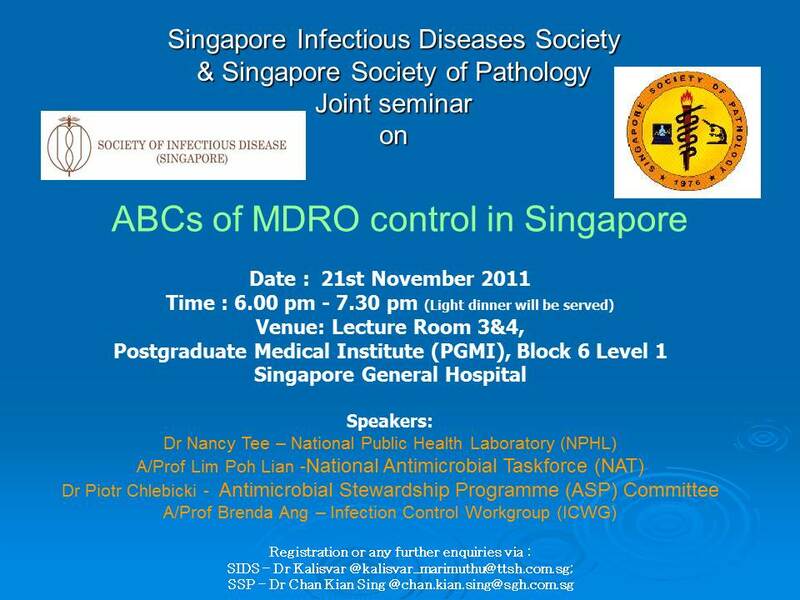 Sessions are accredited with CME points by the SMC. All are welcome. Date: Monday, 20th August 2018 Time: 1– 2 pm. 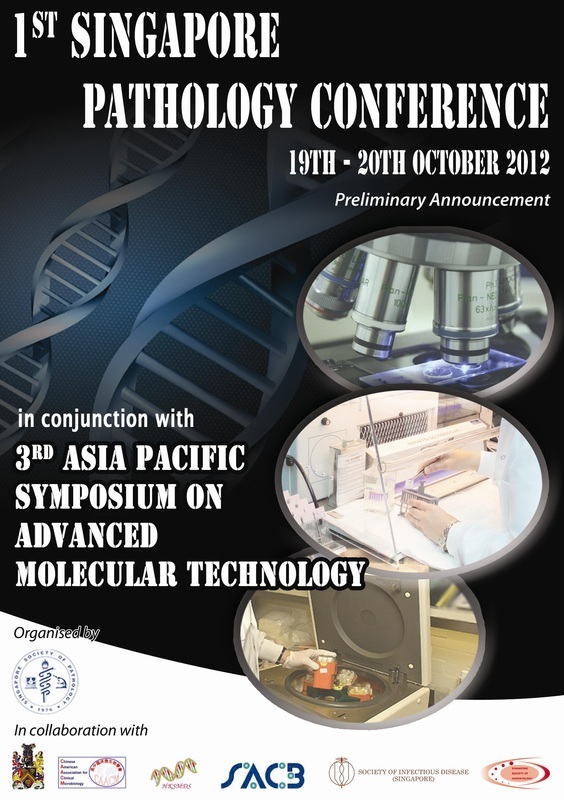 SSP is proud to be a collaborating organisation for the the 1st SGH Clinical Pathology Frontiers in Technology Workshop. This Frontiers in Technology (FiT) Workshop encompasses fundamentals and hands-on experiences on Separation Science techniques. Users will gain an all-rounded understanding of separation sciences in clinical applications. The workshop will also share day-to-day quality assurance and troubleshooting strategies that are important for the modern day Clinical Biochemistry Laboratory. 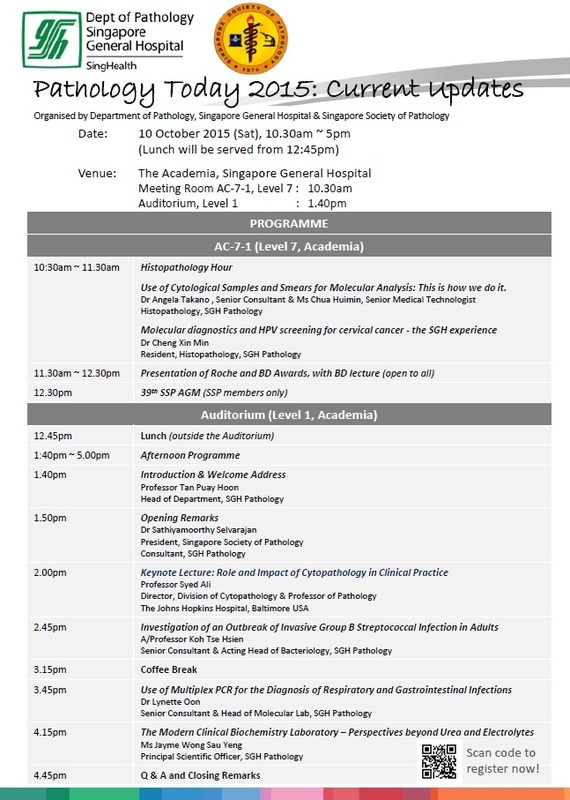 ​SSP is proud to be a collaborating organisation for the annual SGH Pathology Today Seminar on Saturday, 14 October 2017 at SGH Academia Auditorium! 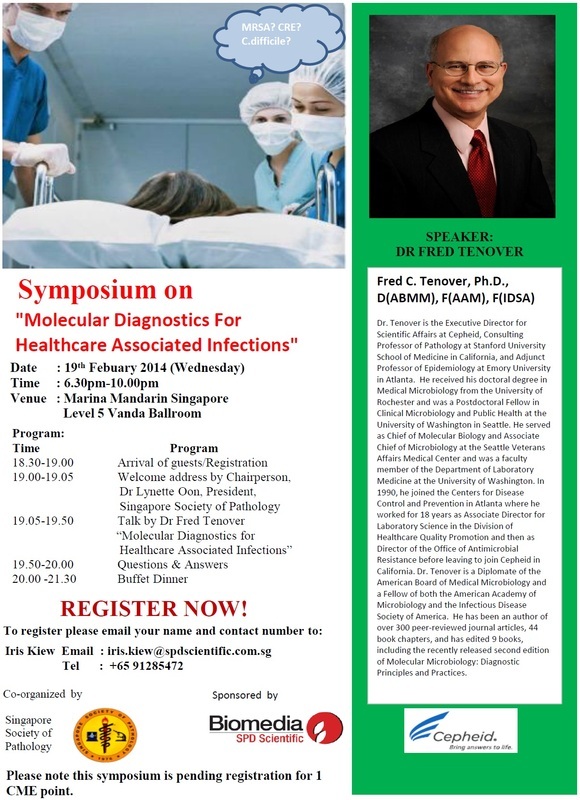 The theme for this year, "Clinical Pathology in the Value-added Patient Journey", covers an interesting array of topics ranging from state-of-the-art technologies in Clinical Biochemistry, quality assurance and customer service, best practices in phlebotomy and optimising use of blood and blood products. Description: The International Melanoma Pathology Study Group will be conducting the 10th International Melanoma Pathology Symposium the day prior to commencement of the 9th World Congress of Melanoma and 14th International Congress of the Society for Melanoma Research. This full day symposium conducted by leading international pathology experts will highlight important contemporary issues in melanoma pathology, clinical care and research. ​ Themed Changing Paradigms in Infectious Diseases, SIIDC 2017 will bring together a plethora of knowledge of clinical and scientific topics from zoonotic to vector-borne diseases, respiratory infections, current and emerging pathogens, and innovation in research and development of infectious diseases. The conference aims to address current gaps, new challenges, and research breakthroughs through a compelling line-up of presentations from renowned and leading speakers in their fields. Date: 24th to 26th August 2017. The conference will cover topics in the following areas: Laboratory Management, Clinical Chemistry, Molecular Diagnostics, R & D - Next Gen Diagnostics, Infectious Diseases, Haematology, Gastro Intestinal Oncology among others. This program is about integrating NGS into clinical oncology: Strategies, promises & limitations. 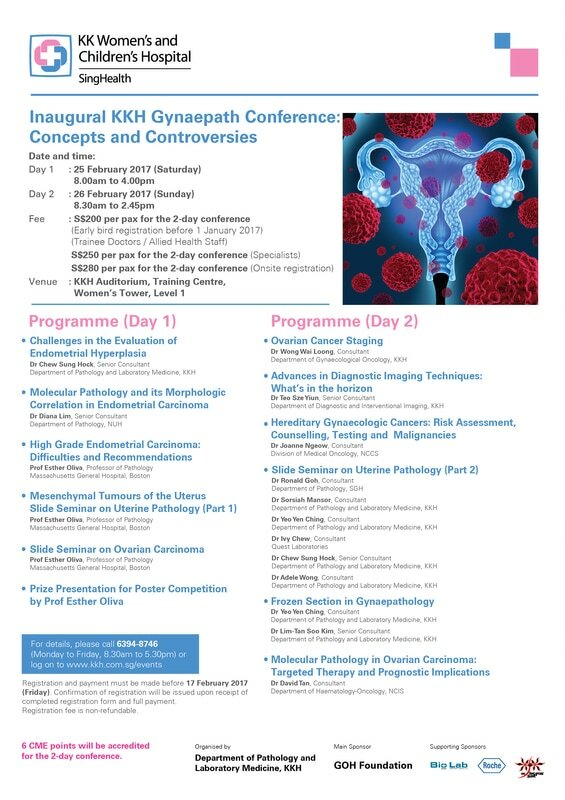 This Scientific Exchange Symposium will bring together approximately 20-25 genomics and oncology experts from Taiwan, Singapore, Thailand, and Malaysia, to participate in didactic, interactive, and cancer-based case sharing sessions. Time: 12:30 PM and 4:00 PM. 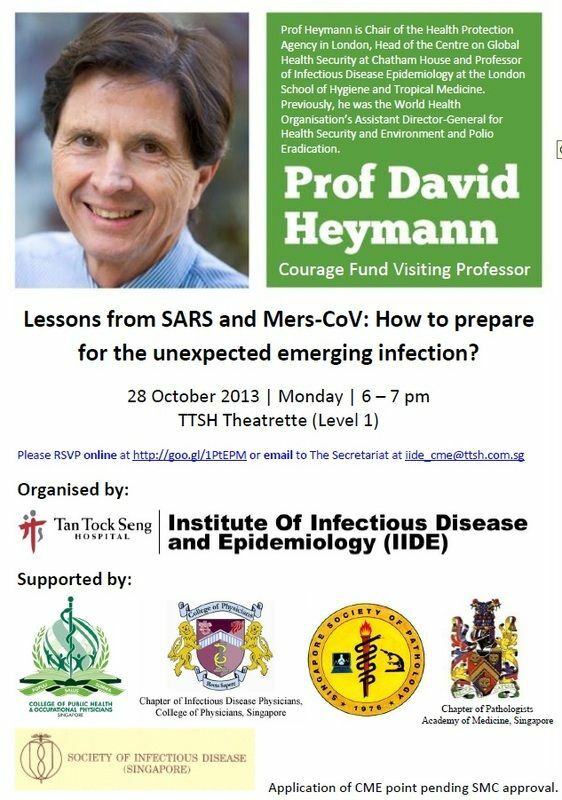 Symposium on "Molecular Diagnostics for Healthcare Associated Infections"
Lessons from SARS and Mers-COV: How to prepare for the Unexpected emerging infection?